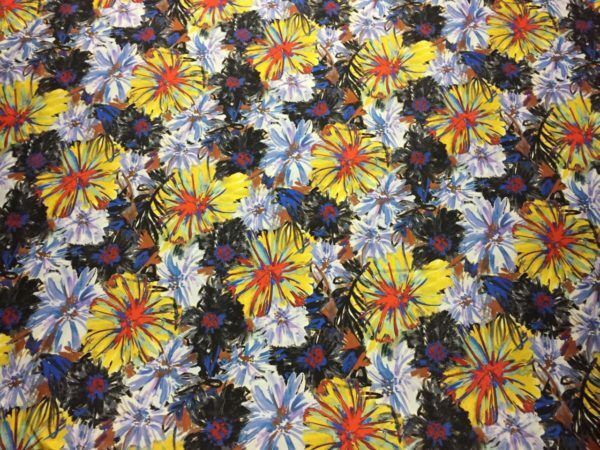 Mikado Twill with an explosive Floral Print of Orange, Yellow, Red, Blue, Black, Purple and Brown. A medium weight (180 GSM) with drape, made of 20% Cotton/80% Silk Blend. This is like a suiting, but you could use it as you would a taffeta, cotton sateen, peau de soie or any bottom/dress weight woven. Made in Italy, 53″ wide.